In a letter to the Vancouver Overseas Artillery Association, Brigadier-General Andrew George Latta McNaughton informed them that the guns for the new Brigade were on the way from England. The formation of the unit had been based on recommendations of the Otter Committee. 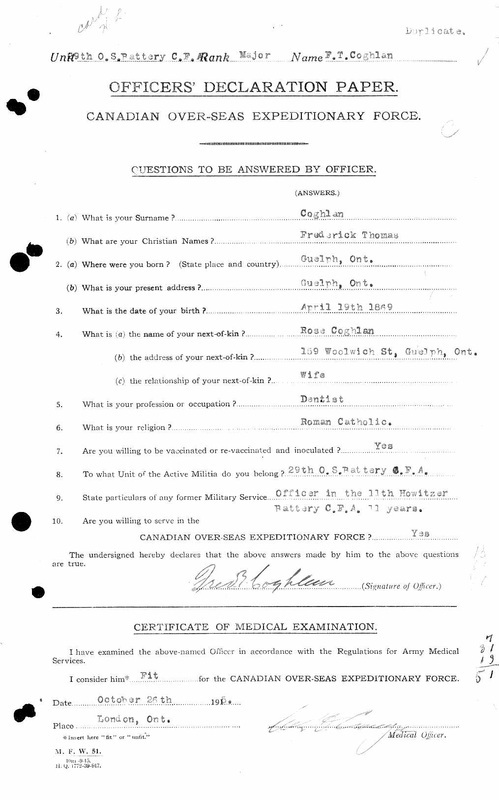 In 1919, as units of the Canadian Expeditionary Force returned to Canada, the military was faced with a problem brought about by the Minister of Militia and Defence, Colonel Sam Hughes, who had ignored the existing structure of the Militia in 1914, as well as pre-existing mobilization plans drawn up in 1911, and built up the CEF from newly created units. Long before hostilities ended, many officers and men in the Canadian Expeditionary Force overseas were giving serious thought as to what place their particular unit might have in the structure of Canada's post-war militia...(T)he mobilization which followed his "call to arms" in August 1914 had created an order of battle of newly-formed units whose numerical designations showed their complete lack of identity with (units) of long standing in Canada's militia organization. These CEF units quickly established their own individuality; and the part they played in the war had given them a high espirit de corps and traditions of their own. The problem was now was how to preserve these new traditions. In January 1918, in anticipation of the war's end, the Chief of the General Staff Major General W.G. Gwatkin recommended to the new Minister of Militia, Sydney Chilton Mewburn, that a "Demobilization Committee" be appointed, to be chaired by Major General Sir William Dillon Otter. Otter had earlier submitted a draft demobilization scheme, and thought the demobilization would be an opportunity to reorganize the Active Militia along more efficient lines. After the Armistice in November 1918, requests for perpetuation of CEF units - primarily infantry and artillery - began to inundate the Militia Department. In April 1919, the "Committee on Militia Reorganization" was appointed; this committee is usually referred to as the Otter Committee by historians. The committee was given a mandate to "investigate and report on the absorption of units of the Overseas Military Forces of Canada into the Canadian Militia, in order to preserve their identity and traditions." 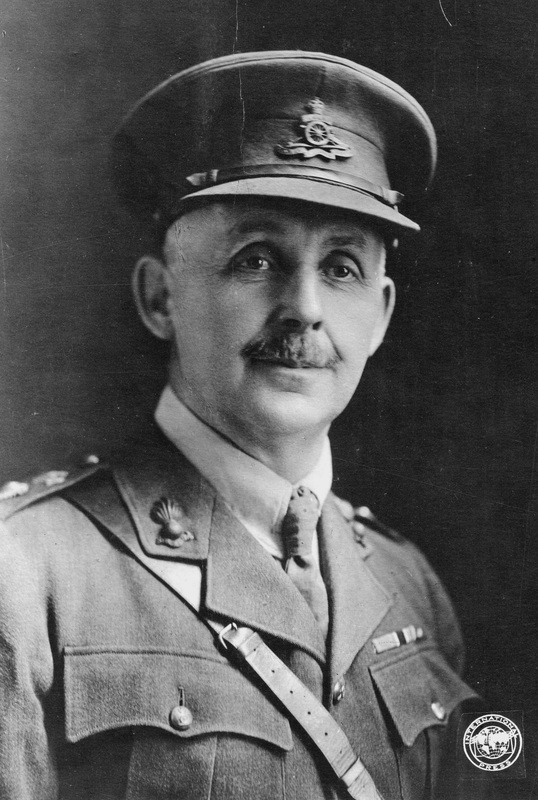 In the summer of 1919, Macdonnel and Cruikshank were replaced by Major General Sir E.W.B. Morrison and General Gwatkin, respectively. The Committee began its work by discussing submissions put forward by the CEF units themselves. Two of the members of the committee - Morrison and McNaughton - had actually drawn up a proposal for "the Incorporation of the Artillery of the Canadian Expeditionary Force into the Canadian Militia (non-permanent)" while serving overseas - McNaughton as General Officer Commanding Heavy Artillery, Canadian Corps, and Morrison as General Officer Commanding, Royal Artillery. After the formation of the Committee, the transition from war to peace was not easy for the nation. Tens of thousands of Canadian soldiers remained overseas for months, with some going on to fight in Siberia and others deployed to Germany on occupation duty. The majority waited impatiently in the UK for repatriation. Unemployment began to rise as soldiers came home, and the demand for war industry had vanished. Canadians watched with trepidation the political instability in Europe, such as the Russian civil war, and fear of an "international Bolshevik conspiracy" grew. The world-wide influenza pandemic which arrived in North America in September 1918 would cost Canada 50,000 dead, almost as many as died in military service in the First World War. The disease petered out in 1920 having killed 25 million people, almost 16 million more than died of war-related deaths from 1914-1918. From September 1919 to December1919, the Committee visited every Military District in Canada, and heard the views of commanding officers of both CEF units and Militia units. Those that had served overseas with the CEF had very strong desire to see their units' histories and designations perpetuated in the postwar military. A final meeting was held on 22 December 1919, and on that date submitted an Interim Report entitled "Re-Organization of the Artillery of the Active (non-permanent) Militia." The Committee was dissolved on 29 June 1920 without producing a final report on the reorganization of the Militia as a whole. 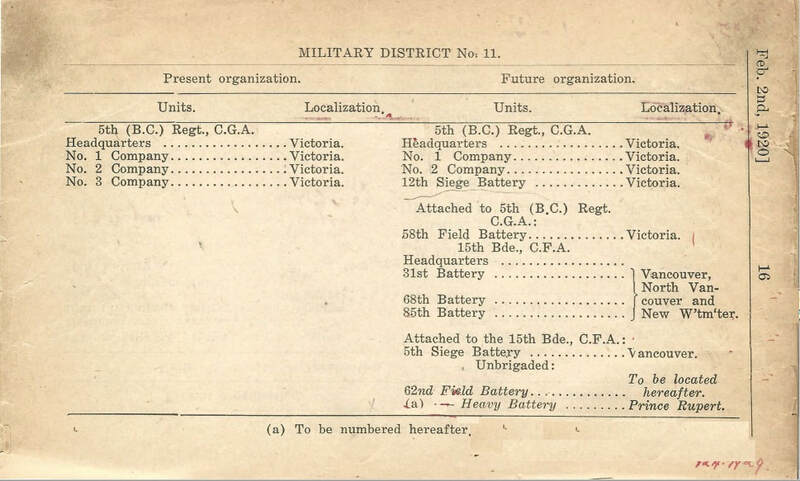 In February 1920, a General Order authorized the formation of new artillery units and redesignation of existing ones, preserving the designations of all 85 field batteries of the CEF, and providing for an anticipated postwar army of eleven infantry divisions and four cavalry divisions. The artillery brigades into which the field batteries were grouped would also be perpetuated, as well as units of siege and heavy artillery. The committee also urged that reorganization occur before the commencement of summer training that year. The Committee had greater obstacles in tackling other problems. It was emphasized that the Militia would have to accept veterans from overseas as qualified for rank and promotion earned in France and Flanders, even without certificates from military schools (or the political connections that were sometimes used before the war). In April 1919, the new list of Permanent Force units had been drawn up and had not included any French-speaking units. The Committee was petitioned by the City Council of Québec to make the 22nd (French Canadian) Battalion “a portion of the permanent Militia Force …stationed in the City of Québec”. The Committee agreed to perpetuate the 22nd Battalion by the creation of the Royal 22e Regiment. The petition was strongly backed by the Quebec branch of the Great War Veterans’ Association and therefore succeeded. Other petitions, such as one by Member of Parliament Major H.M. Mowat for compulsory military service, did not. Brigadier General McNaughton calculated the cost of training all physically fit Canadian males from the ages of 18 to 25, figuring 40 days of annual training for three years with local NPAM regiments, and discounted the idea. The largest and thorniest issue, however, was the perpetuation of the CEF's infantry battalions - some 260, with 110 prewar Militia Regiments also to be considered. The plan for for the post-war Militia would envision the 15 divisions mentioned above with 170,000 volunteers with a reserve for home defence of 300,000 men. The plan was promulgated by General Orders in 1920, but never realized, and finally quashed in 1936. It is worthy of note that a full-blown war effort in 1939-1945 only yielded five overseas divisions and three divisions for home defence. General Macdonnell, one of the original members of the Committee and in wartime a much-loved commander of the 1st Canadian Division, was of the opinion that it would be of much less consequence to lose a dozen Militia regiments than to lose any of the CEF units. The Chief of the General Staff disagreed and, according to Stephen J. Harris in We Stand On Guard, "convinced the government that the credibility of the existing Militia must be protected." In the end, the CEF Battalions were disbanded, with their Battle Honours to be passed to the regiments of the Militia, which were all heavily reorganized and in almost all cases renamed. Multiple perpetuations of CEF units occurred. According to Harris: The generals were confident that veterans would ignore this slight to their accomplishments in France and Flanders and that they would eventually transfer their allegiance to the Militia unit which Ottawa decreed now perpetuated their wartime battalion. They were wrong. Most veterans had better things to do than put on a uniform again, even on a part-time basis. Most of the young men who came of age in the early 1920s, meanwhile, knew enough about war to understand there was nothing at all romantic about it - or joining the citizen army. While the cavalry and artillery thus perpetuated the names of the units that fought in France and Flanders, the infantry by and large did not. Frederick Thomas Coghlan DSO DDS LDS was born in Guelph, Ontario, son of Thomas Coghlan and Jane (Sweetnam) Coghlan. He was educated at the Guelph Collegiate Institute and at the University of Toronto where he obtained his DDS and LDS. 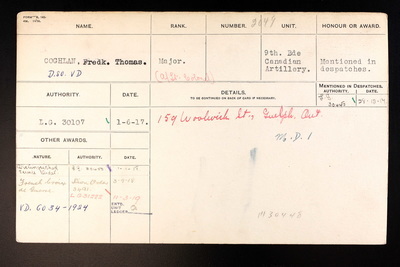 In 1904 he joined the 11th Battery, 1st Brigade of the Militia Reserve and in June 1915, organized and recruited the 29th Battery, Canadian Field Artillery (CFA). In France, Coghlan commanded the 29th Battery, CFA, at Ypres, the Somme and Vimy. After the second Battle of Ypres there followed sporadic frontal attacks on both sides without any result other than the slaughter of tens of thousands of men. Conditions were appalling. The troops lived in the squalor and dankness of the trenches, sometimes knee deep in water and mud. In 1917, Coghlan was promoted to Acting Lieutenant Colonel and Officer Commanding, first the 11th Brigade, and later the 9th Brigade, CFA. He was awarded the Distinguished Service Order (DSO) for gallantry at Passchendaele and the Croix de Guerre for bravery at Amiens, France. In January 1899 he married Rose Hazelton, daughter of Mr. and Mrs. James Hazelton. They had one son and two daughters. The order was established for rewarding individual instances of meritorious or distinguished service in war. This is a military order for officers only, and while normally given for service under fire or under conditions equivalent to service in actual combat with the enemy, it was awarded between 1914 and 1916 under circumstances which could not be regarded as under fire. After 01 January 1917, commanders in the field were instructed to recommend this award only for those serving under fire. Prior to 1943, the order could be given only to someone Mentioned-in-Dispatches. 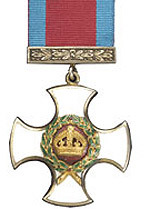 The order is generally given to officers in command, above the rank of Lieutenant-Colonel and awards to ranks below this are usually for a high degree of gallantry just short of deserving the Victoria Cross. BarsA bar is awarded for an act which would have earned the order in the first place. The bar is plain gold with an Imperial Crown in the centre. The year of the award is engraved on the reverse. A gold cross, enamelled gold and edged in gold. In the centre, within a wreath of laurel, enamelled green, the Imperial Crown in gold upon a red enamelled ground. On the reverse, within a wreath of laurel, enamelled green, the Royal Cypher in gold upon a red enamelled ground. A ring at the top of the medal attaches to a ring at the bottom of a gold bar, ornamented with laurel. At the top of the ribbon is a second gold bar ornamented with laurel. The red ribbon is 1.125 inches wide with narrow blue edges. A rosette is worn on the ribbon in undress to signify the award of a bar. There have been 1,220 Distinguished Service Orders, 119 first bars and 20 second bars awarded to Canadians. The Croix de guerre 1914–1918 (English: War Cross) is a French military decoration, the first version of the Croix de guerre. It was created to recognize French and allied soldiers who were cited for their service during World War I, similar to the British mentioned in dispatches. Soon after the outbreak of World War I, French military officials felt that a new military award had to be created. At that time, the Citation du jour ("Daily Service Citation") already existed to acknowledge soldiers, but it was just a sheet of paper. At the end of 1914, General Boëlle, Commandant in Chief of the French 4th Army Corps, tried to convince the French administration to create the formal military award. On December 23, 1914, the French deputy Georges Bonnefous proposed a legislative bill to create the Croix de la Valeur Militaire ("Cross of Military Valor") signed by 66 other deputies. Émile Driant, a deputy who served in the war zone during much of this time, became its natural spokesman when he returned to the legislature. On 18 January 1915, Driant submitted this bill but the name of the military award was renamed the Croix de guerre ("Cross of War"). After parliamentary discussions, the bill was adopted on 2 April 1915. World War I began in 1914 and ended in 1918, so the final name became "Croix de guerre 1914–1918". Every Croix de guerre carries at least one mention awarded for gallantry to any member of the French military or its allies. Degrees indicate the importance of the former soldier's role during the War. The lowest degree is represented by a bronze star and the highest degree is represented by a silver palm. The number of mentions on a Croix de guerre is not limited. The cross was designed by the sculptor Paul-Albert Bartholomé. It is 37 mm in diameter, Florentine bronze cross patée, with two crossed swords between the arms. The center of the front side shows the symbolic profile of the French Republic: a young woman wearing a Phrygian cap. The words République française (French Republic) encircle the portrait. The back of the medal shows the dates of the conflict: first, it was 1914–1915 then 1914–1916, 1914–1917 and finally 1914–1918. The cross is suspended by a green ribbon with seven narrow vertical red stripes. 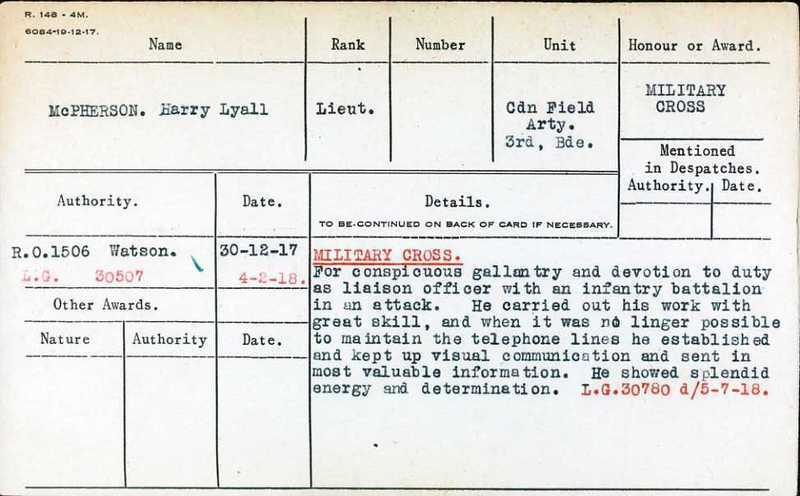 Lieutenant Harry Lyall McPherson joined the Brigade. He had previous service with the 3rd Brigade Canadian Field Artillery and was awarded the Military Cross for conspicuous gallantry and devotion to duty with that unit in 1917. 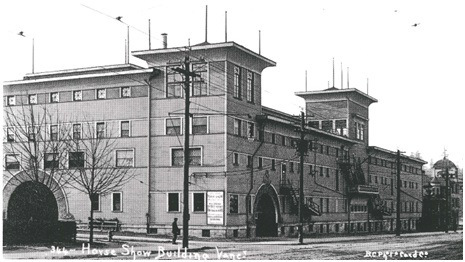 The Brigade moved into the Horse Show Building on West Georgia near the entrance to Stanley Park. It had the advantage of a riding ring and stopped at that. Damply hot in summer, misty and leaky in winter, filled with gloomy rows of dusty, unsafe galleries, reeking first of horse manure and later of Carbolic Acid … We worked in it, we played in it, and we grew to regard it with that strong affection which made the Belgian Peasantry cling to their hovels under shell fire. There was no funding set aside for summer training this year. The Brigade received 18-pounder guns for the field batteries and the 60-pounder gun for the 5th Siege Battery. This British Ordnance gun was a 5 inch (127 mm) heavy field gun designed in 1903-05 to provide a new capability that had been partially met by the interim Quick Fire (QF) 4.7 inch Gun. It was designed for both horse draft and mechanical traction and served throughout the First World War in the main theatres. It remained in service with British and Commonwealth forces in the inter-war period and in front line service with British and South African batteries until 1942 being superseded by the BL 4.5 inch Medium Gun. Gunner Wilbert Adams. Served with the No. 5 Siege Battery Canadian Garrison Artillery during Woeld War I. Deceased 21 May 1920 and buried at Lower Montague, Prince Edward Island.